This book provides guidance on how to design, perform and publish the clinical research needed to fill some of the voids in the scientific literature. Written by recognized experts, these articles originally appeared as “Clinical Research Focus” contributions to TRANSFUSION. In 2007, TRANSFUSION implemented a new section termed Clinical Research Focus. The section was intended to address the growing enthusiasm for evidence-based transfusion medicine studies and publications, which were hampered in the past by a lack of knowledge of the basic and applied principles that plagued some of the literature. 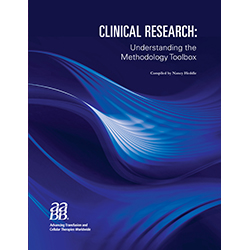 The intent of this section was to invite short articles on a variety of topics and considerations that cover some of the tools in the clinical research methodology toolbox. The intent of this book is to pull these articles—along with several editorials on the subject—into a single publication that will serve as an educational tool and resource for trainees, clinical research investigators, and health-care professionals.